In this photo made from the footage taken from Russian Defense Ministry official web site, Wednesday, Oct. 7, 2015, a Russian navy ship launches a cruise missile in the Caspian Sea. As many as four Russian long-range cruise missiles launched from warships in the Caspian Sea fell short of their Syrian targets and crashed in Iran, U.S officials said Thursday. The officials gave no information about exactly where the errant missiles might have landed or whether they caused any damage. The Russian Defense Ministry has denied that any missiles went awry. Ministry spokesman Major General Igor Konashenkov said that "all rockets fired from ships found their targets, however unpleasant and unexpected it may be for the Pentagon and Langley" — a reference to Central Intelligence Agency headquarters in Langley, Virginia. Russian officials said 26 cruise missiles had been launched at 11 Islamic State targets, which were destroyed without causing any civilian casualties. Most of the cruise missiles landed in and around Aleppo, Syria, U.S. officials said. Russia on Wednesday ramped up its air campaign in Syria with heavy aerial bombardments and, for the first time, cruise missile strikes launched from ships in the Caspian Sea, in support of a major ground operation by the Syrian military. The global intelligence firm Stratfor in Austin, Texas said this was the first time that Russia had used this kind of cruise missile in an actual operation. "They've tested these before, but we've never seen Russia apply them in an active combat situation," Stratfor military analyst Sim Tack told VOA. He said that four missiles going astray was unusual compared with the U.S. track record on cruise missiles. "When we look at the incident where four of them crashed into Iran, that obviously shows they're not at that same stage yet, that this is still an early capability for Russia that they're still getting used to, which is not as proven or tested yet as the American alternatives," he said. Tack said Russia's use of cruise missiles was likely "more symbolic." He said U.S. military operations often begin with the launching of cruise missiles from surface ships. "One of the symbols Russia is trying to create here is that they are conducting that same type of operation, that they have the same capabilities," said Tack, director of analytical support at Stratfor. The Russian cruise missiles are likely of the 3M-14 Biryuza variety and not the Kaliber, as had been reported, Stratfor said. The bodies are similar but the missiles have different warheads and operational software. NATO Secretary General Jens Stoltenberg speaks during a news conference at NATO headquarters in Brussels, Oct. 8, 2015. U.S. officials from the Defense and State departments made new calls for measures to prevent collisions between Russian and coalition aircraft. "We continue to call for measures in place to prevent mishaps and misunderstandings in the airspace," said Pentagon spokesman Captain Jeff Davis. State Department spokesman John Kirby said Thursday that he could not confirm the off-target missile landings but added that such incidents would point all the more to the need for proper "deconfliction procedures." Moving forward with deconfliction was one subject raised by Secretary of State John Kerry in a telephone conversation with Russian Foreign Minister Sergei Lavrov on Thursday. Kerry also raised concerns that the "preponderance of targets" being struck by Russia's military forces in Syria were not Islamic State sites. Kerry also talked about the importance of moving forward on a political track in Syria. Noting the "troubling escalation" of Russia's military activities in Syria, NATO Secretary-General Jens Stoltenberg said the alliance agreed Thursday to double the size of its rapid response force to 40,000 troops. Stoltenberg's comments came in Brussels, where Russia's intervention in the Syrian civil war was high on the agenda in talks among NATO defense ministers. U.S. Defense Secretary Ash Carter addresses a news conference during a NATO defense ministers meeting at the alliance headquarters in Brussels, Belgium, Oct. 8, 2015. The issue took on more importance after reports this week that Russian jets involved in the Syrian air raids had violated the airspace of Turkey, a member of the U.S.-backed military alliance. 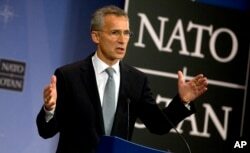 "NATO is ready and able to defend all allies, including Turkey, against any threats," Stoltenberg said. "NATO has already responded by increasing our capacity, our ability, to deploy forces, including to the south, including in Turkey." U.S. Defense Secretary Ash Carter said at the meeting that Russia would soon begin to suffer casualties after dramatically expanding its military support Syrian President Bashar al-Assad, a longtime ally. "This will have consequences for Russia itself, which is rightly fearful of attacks. ... 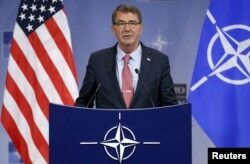 In coming days, the Russians will begin to suffer from casualties," Carter said. Carter described a trend of unpredictable military action that has put the U.S. and its allies on edge, including Russia's firing of cruise missiles at Syrian targets this week without giving any advance warning. "We've seen increasingly unprofessional behavior from Russian forces. They violated Turkish airspace. … They have shot cruise missiles from a ship in the Caspian Sea without warning; they have come within just a few miles of one of our unmanned aerial vehicles," Carter said. Carl Hvenmark Nilsson, a visiting fellow at the Center for Strategic and International Studies in Washington, told VOA's Persian service that the NATO alliance sees Russia's growing involvement in Syria as "deeply problematic." "It is clear from Ankara that they see this as a hostile act and that they are very worried" that Russia's jets infringed on Turkish airspace, Nilsson said. National Security Correspondent Jeff Seldin reported from Washington. Carla Babb contributed to this report from the Pentagon. Pam Dockins contributed from the State Department.